It’s hunting season here in Oklahoma; no license needed and weaponry is just a matter of personal taste. Some of us on the ranch kill with our bare hands, but me, I don’t have the stomach for the “wet work.” I prefer the bottom of my shoe. Here on the 160 we’ve instituted a Zero Tolerance Program (ZTP) for this particular varmint. 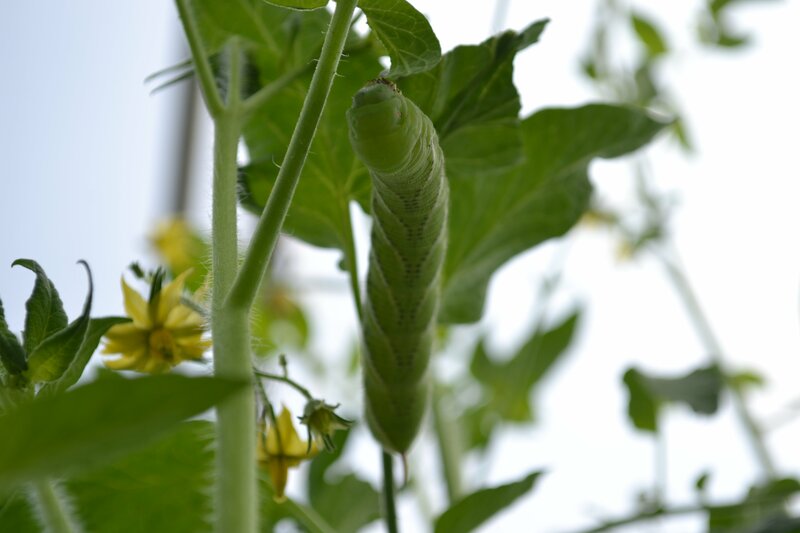 The prey: the crafty, conniving and voracious hornworm. Where do hornworms come from? Large (and really quite beautiful) Sphinx moths deposit eggs on the undersides of tomato leaves and the larvae eventually chew their way out of the eggs and into the green Eden of healthy, succulent tomato plants. The tiny caterpillars become fat, juicy and quite large (3″-4″) as they feast on the tender leaves. They seem to love to dangle from the very tops of the plants, but it takes patience to spot these critters. They are the color of the plants on which they feed, but the tiny spike at the ends of their bodies gives them away. Hornworms can quickly and efficiently strip bare the branches. The caterpillars – if my shoe doesn’t find them first – will molt four times before going walkabout. They find some nice, comfy soil, dig in and during the final molt a green skin forms which eventually – buried – will turn hard and brown. After about three weeks, the skin splits and an adult moth emerges – to begin the cycle of destruction all over again. thanks for the information on hornworms. I will be keeping my eyes open for them. Any I find will meet the fame fate as the ones you find: being squished. Excellent! Don’t let them escape ;-)! Good luck with that, Ann! We’ve got those pesky varmits here, too, but *so far* I haven’t found any lurking in my own tomato plants. Still, my shoes are ready! Good photos help other crusaders target the right varmint ;-)!! Complete dirtbags AND ratbags!! My veganism only goes so far! I kill spiders, wasps, and mice and voles (I know so mean, but they invade my house otherwise)….. Shhh. Does that make me a vegan ratbag? Should I be lovingly luring them with vegan treats and packaging them up and taking them to the woods? Cute little guy! Too bad he’s so poorly behaved..I love the colors in these photos! Very, very badly behaved guests! But indeed, their color is quite lovely. Nature is an amazing place – both the good and the bad! This gave me the heebie-jeebies. I HATE moths. I have a total phobia. I would help you kill every one of these if it meant less moths in the world. I support your noble cause! Is there a “good” moth out there?? I’ve been fighting pantry moths for 2 years. Really hate those. Yep, I know the feeling. Nasty creatures. ick. those pics and the description really grossed me out…now ill be on hyper patrol…my poor little tomato plant is just a young thing still. i need a volunteer to squish them for me though. i dont think i could do it. I have a hard time, too – especially when they get really big. But they can undo a tomato plant in no time flat! Ewww!!! I have already had a lot of trouble with army worms, now some kind of strange beetle looking creatures. I wonder if these hornworms are next? They are quite camouflage! I thought I was just looking at a curled up tomato leaf with black dots on it, I didn’t even realize I was looking at one of the caterpillars in that middle picture. I hate squishing anything so I opt for drowning in soapy water…but I still hate doing that too, I can’t watch. Thanks for the information. My current nemesis ;-)! How did your informal polling go yesterday? I was on the road, read your post, but my phone wouldn’t let me comment, dang it! oh I’ve always loved these little guys! I’d like to love them, but…I love my tomatoes more ;-). I must admit that I’m with Rachel, I rather like caterpillars, although I know they are a complete menace. They remind me of my childhood, picking them up and being fascinated by the way they move. I suppose if I had tomato plants that were being destroyed by them I might feel quite differently, but I do think your hornworms are really quite pretty (sorry!). I hope they crawl off and find their food elsewhere. For the love of tomatoes it must be done! Haha! I’m picturing that on a t-shirt! I used to keep a couple of thin boards lying around the garden for hornworm smashing. It is a nasty business because they are big and juicy, but somebody has to do it! Good luck my friend! They ARE big and juicy! One must have a strong constitution to squash them. I’ve used Neem in the past – but I like the garlic/ginger/chiles! Great idea – thanks, luv! I find these oddly creepy, however I would much rather have these eating my Swiss chard instead of the snails. Finding a snail in my produce is terrifying. Yep. Snails beat hornworms for sheer slimy creepiness. Some people use their hands? Blech! Yeah, Kel doesn’t seem to mind that kind of thing, but I wouldn’t even think of doing it. You’ve got some majorly scary creepy-crawlies where you are! Thanks for introducing this worm to me! I also have several tomato plants & check the leaves daily on insects, etc! I will be on the lookout for this nasty one! Great pics too! thanks for info and pics ! i found a few of them in my garden this summer. while knowing what they do, i didn’t hesitate to squish them dead under my shoe !